In this picture, I am with Cassi and Meghan. This was taken after we rushed the field after the Penn State game. It was such an incredible moment and I felt so connected to everyone in that stadium. The whole game was so amazing. Being around my friends in such an intense moment was a great experience. We had so much time cheering and being sad and cheering again. Every time we scored we high-fived each other and when they scored we got sad together. When we scored that last touchdown I just felt so at home with the people around me and I loved that feeling. 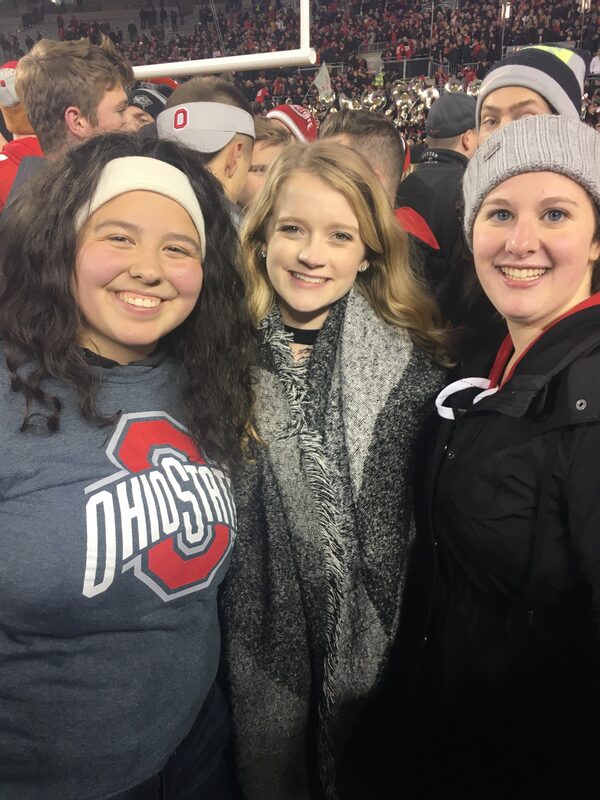 After we won we rushed the field and it was so cool to be on the field with my friends and to be able to celebrate a huge win with people who mean a lot to me. This was such an incredible time and I’m really glad I got to spend this moment with my friends. Posted by Jennifer Sizemore at 9:58pm Posted in Artifacts. Bookmark the permalink.